My grandmother made beautiful quilts. After my grandfather died, she moved to the Upper Peninsula of Michigan, because they'd planned to retire there, and taught herself to quilt. She did nearly all her quilting by hand, in her lap. In the picture at the top, the top left is a block in the quilt she made for my college graduation. She took pictures from coloring books, traced them onto squares of off-white linen, and stitched them on with white candlewicking thread. I played with the brightness of the photo so you could see a bit of the detail. I have matching shams and throw pillows to go with it. 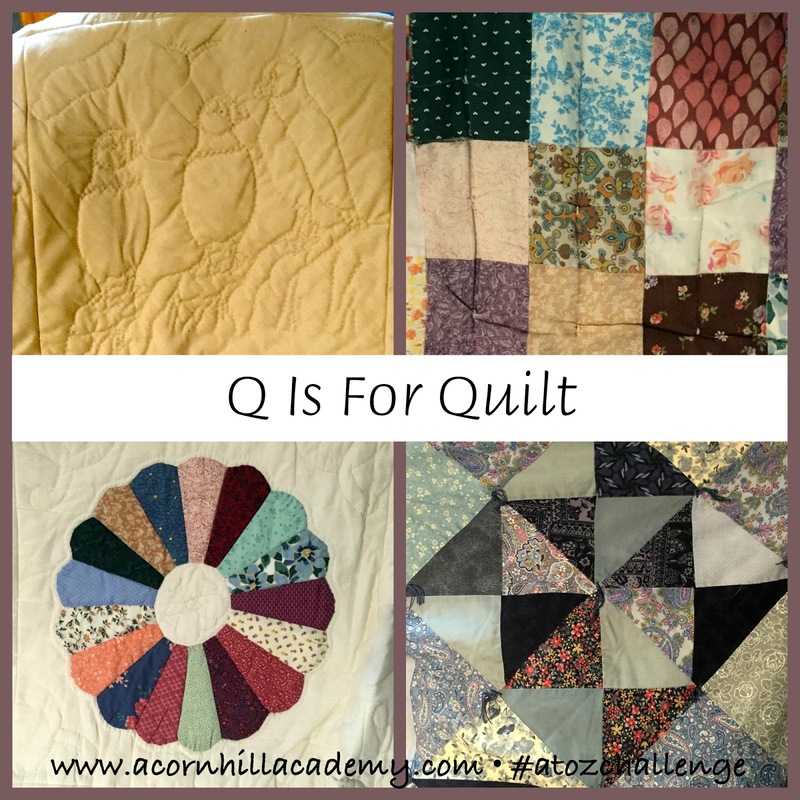 The top right quilt is a simple patchwork she made from fabric that had belonged to her mother-in-law. Most of it is flour sack fabric. Some of it isn't, and there are particular pieces that have disintegrated. I need to take it apart and replace the bad squares, and put on a new backing. My grandma gave me the quilt because I'd asked her once how long it would take to make one like it. My mom suggested that I could throw it away if it were worn out, but...I can't. My grandmother has been gone nearly 6 years, and I miss her. The bottom right is a Dresden plate block. She had made several of them, and told she could either make one big quilt or two smaller ones. I told her I'd gladly give one a home if she made two. Bless her. The bottom right is one she made for my husband. She despised making that quilt. She preferred applique, and less precise patterns, but my husband the engineer chose one with all those triangles. She made it for him, though. She really liked him. I don't think any of the rest of the in-law grandkids got a quilt. I have tried to quilt from time to time. I've learned that what I really like to do is sew together squares after someone else has cut them out. I don't have the patience or the love of design that she had, for sure. So, I don't really quilt at this point in my life. I might try again someday, when my children don't live with me anymore. Over the years, I've found some really sweet picture books about quilts. I used to buy a copy for me and a copy for my grandmother. She loved them, too. I'm going to share a few of them with you today. 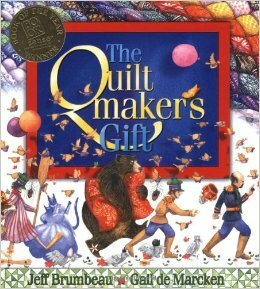 The Quiltmaker's Gift by Jeff Brumbeau- A lovely story about an old woman who makes a quilt for a greedy king, but he must learn to give away his possessions before he can have it, and earns a change of heart in the process. 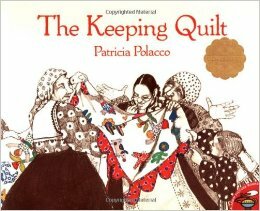 It's a lovely book with beautiful illustrations, and it highlights different traditional quilt squares as the story goes along. The author has a website with more information and some fun stuff. There are two books, Quilts from the Quiltmaker's Gift and More Quilts from the Quiltmaker's Gift, with patterns so you can make your own quilt. I have the first one. It's a lot more involved than sewing pre-cut squares together, so I will let you guess how many quilts I've made. 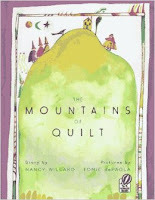 Mountains of Quilt by Nancy Willard- This is a fun story about a grandmother who sews a quilt with scraps of leftover fabric. A magpie brings her the last piece she needs to complete it, which happens to be a bit of a magic carpet. The illustrations are by Tomie de Paola, but they are a little different than his signature style, I think. I can't find my copy in the mountains of books here (still working on post-move organizing), but I remember enjoying the story. The Keeping Quilt by Patricia Polacco - I love many of Patricia Polacco's books, and this one is precious. It tells the story of a quilt made from pieces of clothing from a family - little girls' dresses, aunts' aprons, etc., and is handed down from generation to generation. It's the story of the author's own family. 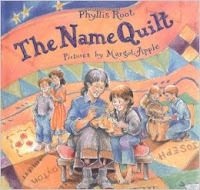 The Name Quilt by Phyllis Root - This one might be my favorite story out of these four books. A little girl named Sadie is visiting with her grandmother during her summer vacation. Her grandmother has a quilt made from fabric of family members' clothing, with names stitched on the squares. The grandmother tells her granddaughter stories of the people behind the names, and shares her family history and heritage through the quilt. One night, the quilt gets blown off the clothesline and away in a storm, and Sadie is devastated by the loss, but her grandmother has her help start a new quilt, and as she listens to her grandmother tell her the same stories, she realizes that she still has the most precious part of the quilt - the family memories. This one makes me teary, as it reminds me of my own grandmother. 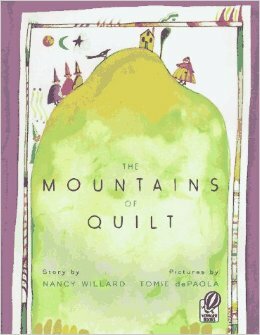 Do you love quilts, and stories about them? 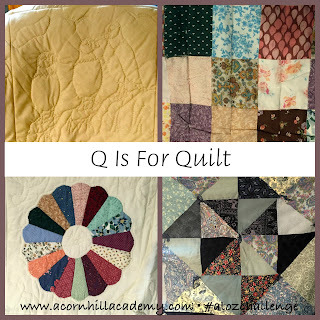 My grandmother was a quilter too and I have many wonderful ones at my house. It was also the first gift she ever gave my husband.